The Kariyarra Mugarinya Joint Venture, a corporation that is run by the Kariyarra native title claim group and Mugarinya Community Association, is today celebrating the commencement of a joint property venture with the Department of Regional Development and Lands. The deal provides funds to develop 12ha of residential land in Port Hedland that was allotted to the Kariyarra Maugarinya Joint Venture in 2007. 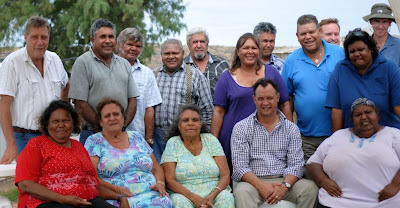 YMAC assisted the Kariyarra people to set up the Joint Venture and receive the land allotment, and is very pleased that Kariyarra Mugarinya has now secured this deal that will help develop housing and security for the community into the future. This is a great outcome for the Kariyarra people and YMAC congratulates them for their work through the Joint Venture that has resulted in this development deal. Regional Development and Lands Minister Brendan Grylls is hosting an event to celebrate the announcement of the joint property venture in South Hedland today.